Santa Monica tomorrow will join the ranks of cities using real-time information to encourage biking. The beachside city, known for its increasing bike-friendliness, will host an official ribbon cutting Wednesday at noon for its first real-time bike traffic counter (click here for details about the event). 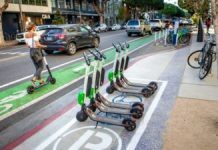 The counter, which will be located at Main Street just south of where it intersects with Colorado Avenue, will communicate with sensors in the green bike lanes and display the number of riders who have ridden by that day as well as the cumulative number of riders for the year. Similar bike counters have already been installed in other bike-friendly cities like San Francisco, Portland, Oregon, and Montreal, Canada. Portland, which also uses the “Eco-TOTEM” counter, was actually the first U.S. city to install one of these counters, the dedication of which was covered in this Streetfilm. 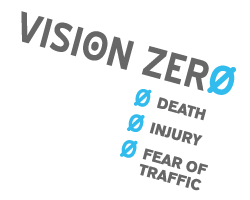 As noted in the film, these counters are more widely used in European cities, like Copenhagen, where biking is a more common-place mode of transportation. 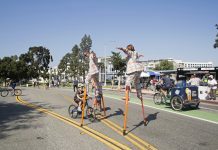 Santa Monica adopted its Bike Action Plan in November 2011 and since then has seen significant changes toward making the city a safer place to ride, including the launch of Los Angeles County’s first public bike-share system, two protected cycle tracks, and the opening of the Downtown Santa Monica Bike Center. Since 2000, Santa Monica’s streets have seen a 356 percent increase in the number of bicyclists, according to city officials in 2014. That number may very well have gone up since then. 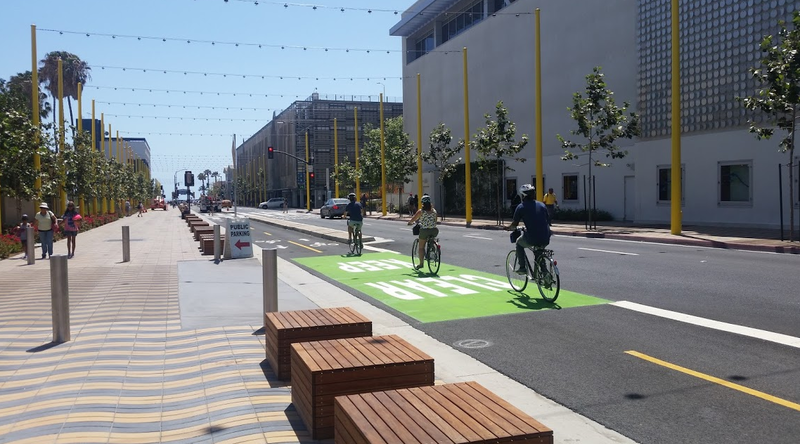 The new bike counter is just the next step in providing the infrastructure and information necessary to make Santa Monica an even better place to ride. 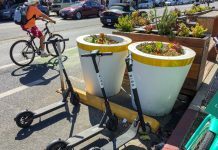 “Biking is a part of Santa Monica’s culture,” said City of Santa Monica Mobility Manager Francie Stefan. The official ribbon cutting is tomorrow from noon to 12:30 p.m. and is open to the public. For more information, please click here for the official Facebook event.